Showing 18 articles from May 4, 2016. Bo Winningham shows off the fresh produce in the Raymond location. After extensive remodelling of the Everybody's store the new owners are rebranding as Thriftway. Everybody's store locations slated to re-brand to "Thriftway"
The Everybody's supermarkets in Elma and Raymond are slated to be re-branded to Thriftway in a Grand Opening on May 4. Franchise Owner Matt Marcott acquired the Everybody's Supermarkets from Jake Myers in November of 2015. It's been six months since the brand has changed hands, and Marcott spoke to what it has been like running the new store locations, "The new ownership has gone well; we hired when we came in but every single person kind of ended up transitioning with us and so it was a smooth transition. At this point we have concentrated on item selection, we've brought in a lot of new items to the store, both conventional and natural," said Marcott. The Hoquiam City Council met on Wednesday, April 27 and held a public hearing on a proposed ordinance regarding the regulations for homeless encampments in the City of Hoquiam. The public present at the meeting showed support in their numbers, some voicing their concern that the ordinance may be too much. The First Friday of May will be held on May 6 starting at 5pm, be sure to come downtown and see the special deals at local businesses that will be open later than usual. 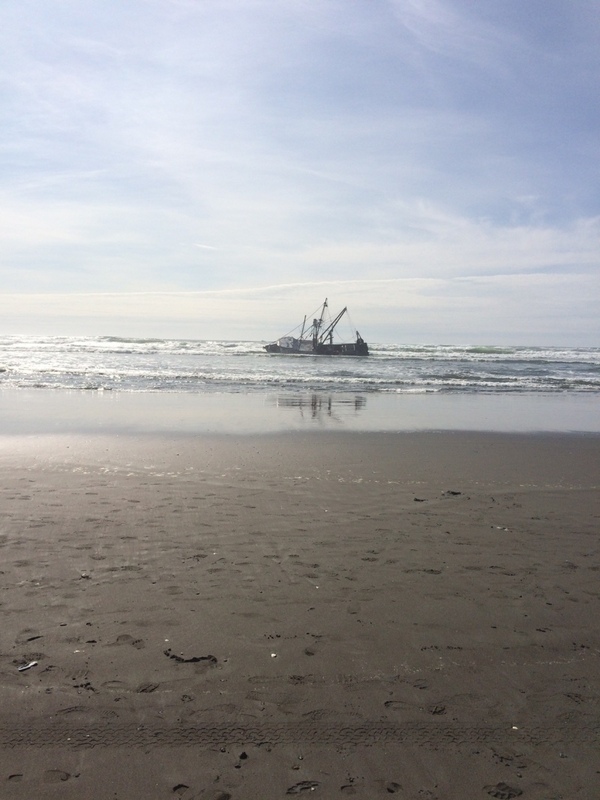 Photo by U.S. Coast Guard - A shipwreck is beached in Ocean Shores and will stay there for at least a couple of weeks due to the tides. The shipwreck is located North of the North Jetty in Ocean Shores where the privateer remains grounded. On Wednesday, April 27 the Aberdeen Police Department received a fraud complaint from the City of Aberdeen Finance Director. The Director related that she received a fraudulent e-mail from someone pretending to be the Mayor of the City of Aberdeen requesting a wire transfer of money to pay for consultants. The director was suspicious and asked additional questions in an email conversation with the suspect pretending to be the Mayor and determined that it was a fraud. The director called the Mayor and confirmed her suspicions. It appears that the suspect gained access to the email system illegally. The suspect gained access to the email system illegally. The suspect was operating from out of state and was requesting that the wire transfers be sent out of state. Due to the careful checking by the Finance Director, no funds were transferred and the City didn't lose any money. On April 27 the Washington State Supreme Court agreed to decide whether a state law to protect ocean resources applies to crude oil export projects proposed in Grays Harbor. The projects would move billions of gallons of crude oil out of Grays Harbor and through Washington's open ocean every year. May 2 - May 20, 2016 - Mail-in declarations accepted. The declaration of candidacy form must be complete, the oath signed and any filing fee included. Filings submitted by mail will be retained for processing until May 16th, when filing opens for all candidates. Fillable Candidate Declaration forms are available on the Elections website at vote.wa.gov/lewis under Candidate Information tab on left. Complete the form, print, sign and enclose any filing fee before mailing. The Community Farmers Market in Chehalis and the McMenamins Olympic Club are once again partnering to offer a Friends and Family Night on Monday, May 23 at the restaurant & pub location in downtown Centralia. McMenamins will donate 50% of Olympic Club sales after 5 pm to benefit the Farmers' Market. Community Farmers Market vendors will provide local, seasonal products for menu specials and raffles. On May 8 all Washington State Parks will be having a fee free day. The theme is "Sunday Spring Day." Take advantage of the beautiful spring weather to take this Sunday with your family and enjoy the beautiful scenery the state of Washington has. A Discover Pass is not required for entry into the parks. Saturday's concert at the Veterans Memorial Museum in Chehalis featured Portland-based Grass Station playing in front of nearly 200 attendees. The performance marked the second show at the Vet hosted by the Washington Bluegrass Association and sponsored by Goebel Septic of Centralia. Whiskey Deaf played at the venue in February. Both concerts have been sold out. Governor Jay Inslee announced today that more than $940,000 in grants will be awarded for programs in 15 counties statewide to help get kids outdoors and connect with nature and their communities. Law enforcement agencies from Lewis County served 21 warrants yesterday during "Operation Spring Cleaning." The collaborative emphasis was conducted to locate and arrest people with outstanding warrants in the Lewis County area. An awards banquet was held last Friday, April 22, to honor local law enforcement and public safety officers who made a positive difference in making Lewis County roads safer in 2015. 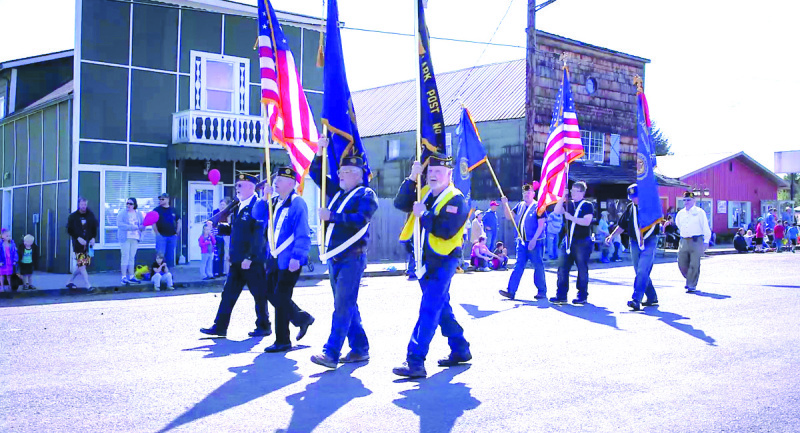 The color guard marching through the streets of Vader in last year's May Day Festival Parade. The annual Vader May Festival is the biggest event for the southernmost town in Lewis County and is the start of the local festival season. The May Festival is always well attended by the people of Lewis County. The May Festival honors the heritage of the town, which was founded in the 1880s as Little Falls. The town has grown from being home to a post office, hotel, general store, and a few settlers, to now having over 600 people in its quiet town. The Fort Vancouver Rose Society will hold its 63rd Annual Rose Show, "Sunshine & Roses," Saturday, June 4, 2016. Toledo went into Cathlamet on Friday April 22 as the top team in the Central 2B league, but they left the home of the Wahkiakum Mules with one loss and a tie for first place with Pe Ell-Willapa Valley. Photo by Brandon Patching United honored their seniors on Saturday. Pictured from Left to Right: Fernando Munoz, Nolan Patching, Miguel Del Campo, coach Horst Malunat, Orlando Hurtado, and Adair Garibay. On Tuesday April 26 Adair Garibay recorded another hat trick and had one assist in a 7-0 league win over the Stevenson Bulldogs. Andreas Malunat and Gustavo Barragan each recorded a goal and an assist for United. Nolan Patching split halves in goal with Alan Contreras. Contreras played the second half in goal and converted a penalty kick in the 68th minute which was the final goal of the game. A Winlock man was sentenced to federal prison on Tuesday, April 19th, for violating the Lacey Act. Harold Clause Kupers, 46, of Winlock, will serve six months in prison, six months of home detention, three years of supervised release, and must pay $160,000 in fines after he trafficked big leaf maple from the Gifford Pinchot National Forest.